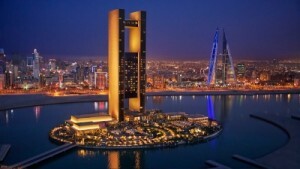 The holiday season at Four Seasons Hotel Bahrain Bay is destined to be an unforgettable experience. With a lineup of special holiday dining and entertainment created with legendary Four Seasons finesse, the Hotel offers something merry for everyone. Hotel guests and Spa members are invited to join the Hotel team for a spectacular Christmas tree lighting ceremony, complete with traditional carols, cookies and festive refreshments. To convey a true Christmas spirit, the lobby will feature glorious holiday décor in elegant colours of gold, complete with a contemporary Christmas tree and holiday-inspired floral arrangements. A gingerbread creation made by Executive Pastry Chef Imad Boukli will be a spectacular and mouthwatering addition. The holiday decor will be in place from December 5, 2016 through January 7, 2017. From homemade chocolate truffles to gingerbread cookies and soldiers, Christmas fruit cake and mince pie, the holidays are the perfect time to indulge. To offer guests a head start on festive season planning, the Hotel opens its popular Christmas Market in its lobby. Traditional festive items such as holiday cookies, honey-glazed turkey-to-go and the signature yule log cake will treat the family to something special straight from the kitchens at Four Seasons. Christmas Market welcomes guests from December 5, 2016 to January 3, 2017, every day from 11:00 am to 9:00 pm. Throughout the festive season, guests will enjoy a daily afternoon tea featuring a host of seasonal treats including mouthwatering honey-glazed turkey and smoked salmon sandwiches, as well as freshly baked gingerbread spiced cookies. Festive Afternoon Tea is served from December 1, 2016 to January 7, 2017 every afternoon from 3:00 to 6:00 pm at Bay View Lounge and is priced at BHD 15 per person or BHD 28 for two people. The Kids For All Seasons complimentary kids camp, open daily for ages 4-12 from 9:00 am to 6:00 pm on weekdays and from 9:00 am to 8:30 pm on weekends, has an array of organised activities planned for Hotel guests throughout the festive season with special focus on the Bahrain National Day, Christmas Eve, Christmas Day and New Year’s Eve. From candy hunts on the outdoor lawn to balloon art, face painting, making festive accessories, writing letters to Santa and cookie decorating along with gingerbread house building, the KFAS team has a thoughtfully orchestrated schedule to provide fun for all ages. Guests are invited to relax at the Hotel’s expansive Spa with the festive 30-30 Spa Treat. A promotional BHD 75 only will be extended in case of booking any two of the following 30-minute spa treatments of their choice: express facial, eye indulgence, body scrub, body wrap, tension back reliever, face and scalp massage, or hand or foot massage. 30-30 Spa Treat offer is valid until December 31, 2016. Savings can only be applied to one promotion at a time.